Villa Dunya is located on the Kas peninsula just outside the picturesque town of Kas, with its own beach platforms and spectacular sea views from every room. It has its own private swimming pool (heated) and shares the garden (3500 m2) and the beach with 4 other villas. At this villa the sea is only one minute away: a few steps through the garden lead you to the sea and beach platforms. This seafront villa offers 155 square meters of indoor living space as well as plenty of partly shaded space on the outside terrace. Even at full occupation the considerable space ensures for guests to escape in peace and quiet, making it ideal for families, friends traveling together, and those simply wishing to relax in comfort to enjoy those stunning views. The Living Room is spacious with an open fire place, a dining area and open plan kitchen. There are 4 double, twin or triple bedrooms with en suite bath rooms, securing privacy for everyone. One of the rooms is a garden retreat (separate entrance). The villa is air-conditioned throughout, has a Jacuzzi. a fully equipped kitchen for self catering, a washing machine, dish washer, satellite TV, DVD player and a stereo CD player. Guests can make unlimited use of the wireless internet; just bring your (Wi-Fi) laptop. The villa is next door to Club Barbarossa where the villa guests are allowed to have special price breakfast for 5 pounds and lunch/dinner for 10 pounds per person (children under at half prices). The garden, the pool and your villa is looked after daily by the Club Barbarossa staff. You can call the reception anytime for any food, beverage or information items. You are also entitled to use the Club's table tennis, billiard and canoes free of charge (up to two hours per day). You can also get advice on tours and sights of Kas from the Barbarossa front office. 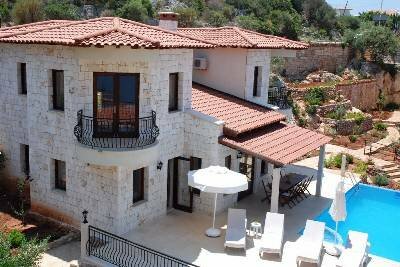 Villa Dunya is located on the Bay side of Kas Peninsula (Cukurbag Yarimada in Turkish). This side of the Kas Peninsula is sheltered: less windy and the sea is perfect for swimming, also early and late in the season. It is a very peaceful location, which is popular by people who like to enjoy their holiday without the street noises, noisy bars and mosques and still be only a 10 minute dolmus ride from the town centre. The picturesque harbour town Kas (Antiphellos in the Greek era) is renowned for its natural charm at the Turkey Rivera. It has an attractive harbour front along which tea gardens, cafes and restaurants are to be found in abundance. Leading away from the harbour is a warren of winding cobbled streets full of colorful shops offering all manner of carpets, ceramics, arts and crafts. Kas has remained relatively unspoiled since, until recent times, it was only possible to reach there by sea or on horseback. Tourism in Kas is international and tends to be of the more elite kind. The town is especially popular with the English, the Germans, the Scandinavians, the French, the Belgians and the Dutch, who come here in search of privacy, peace and quiet, comfort, nature, culture, active pursuits and fine cuisine. There is no mass tourism in Kas - no sprawling (all-inclusive) resorts or apartment complexes with organized entertainment. Many hikers pass through Kas as they walk The Lycian Way (a 509 km way-marked footpath around the coast from Fethiye to Antalya). The Lycian coast - and Kas especially - is famous for its beauty. Kas is recommended in various travel guides and is a stop over for the cruises in traditional wooden Gulets: the Blue Voyages. Kas does not have a sandy beach, but it does have a few pebble beaches and several sun terraces right on the waterfront, which often have a bar. The fabulous sandy beaches of Kaputas (15 km) and Patara (35 km) are easy to get to by minibus and/or boat. Similarly, a fifteen-minute boat trip will take you to Limanagzi - a beautiful beach with a very relaxed atmosphere on the opposite side of the bay. On the peninsula people swim in the sea near the sun terraces of the hotels. Villa Dunya has its own shared beach platforms. On the outskirts of Kas there is a small and reasonably well-preserved Hellenistic amphitheatre. From the highest row of seat you have a fabulous view of the sea. On the hill between the theatre and the market there are a few free-standing Lycian tombs. On the other side of the street from the theatre, there is the barely recognizable ruin of an ancient temple. In the hills immediately behind Kas there are a large number of Lycian rock graves that date back to the fourth century BC. You can see these graves from the town centre, and during the high season they are lit up on some evenings. Kas is centrally situated in relation to many interesting antiquities, cultural attractions and areas of natural beauty, which makes it an ideal base camp for day trips and excursions. The most popular day trips and excursions are mentioned below. It is definitely worth going on a boat trip to the ancient Lycian city of Kekova, the remains of which are mostly submerged. You can go swimming and snorkelling during the trip. Lunch is usually included and is consumed in one of the little restaurants on the waterfront in Kekova. After lunch you have time to go and see the castle of Kekova and the Lycian graves. You can also go on a boat trip to one of the many little islands just off the coast. If you hire a car, you can visit the ruins of the ancient city of Myra, the St Nicholas basilica at Demre, the waterfall between Kas and Kalkan and the stunning Saklikent Gorge all on the same day. Try to be at the gorge around lunch time if you can, so you can lunch on the floating platforms on the river. Lovers of antiquity should also make a point of visiting the highly recommended ruins of Tlos along the way. A trip to Xanthos, which is inland from Kalkan, is also definitely worth doing.